The interviewer Dave O'Connell, editor of the Galway Tribune, took me down memory lane as expertly as any guide to memories past could ever do. About 200 or so showed up to hear my take on the Irish emigrant experience and the Irish American role in the peace process. What struck me most was the number of young Americans who showed. I can see why Galway in summer has become a favored destination for them. This is a truly wonderful arts festival which showcases the best of Irish theater, music, authors, culture and tradition. The fame of the festival has begun to spread far and wide. Many of the Americans who came to my event had planned their trips to Ireland to coincide with the Arts Festival. You could not pick a better two weeks. It is easy to see why. The streets of this ancient city are a jamboree of flame eaters, musicians, comedians, film makers, performance artists and craic. The theaters are packed, the performance venues echo to the sound of music and song. 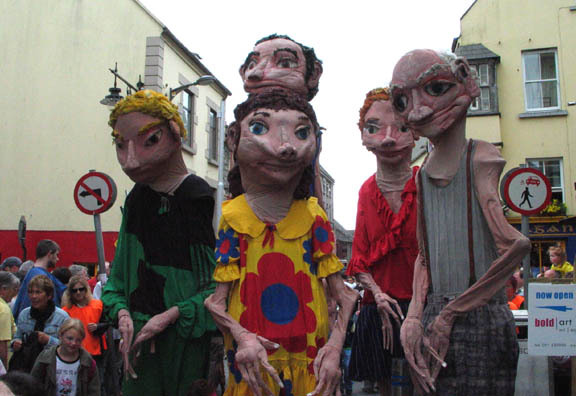 On Sunday comes a huge highlight, the street theater group Macnas, annually leads a Mardi Gras type parade through the streets of Galway. This year, its called 'The Hunt' and 'bankers,priests and politicians', all the bete noires of the day will be hounded from pillar to post during the pageantry. It is a non-stop party in Galway. Next week the Galway Races starts, another week of bacchanalia centered around the Ballybrit racecourse where the ghost of Damon Runyon surely stroll. The dreams and drama of the Galway Hurdle and Galway Plate the two big races, occupy the entire island. If you want an antidote for what is ailing Ireland come to Galway. For all the talk of multinational investment and Silicon Valley ventures, the Irish cure themselves best by playing to their strengths. The cultural lollapalooza that is the Galway Arts Festival emphasizes that, the sporting bonanza of the Galway races follows close on its heels. A man might move to Galway for the high summer and be highly entertained methinks.